For 2013, the Volkswagen Eos introduces a new Sport trim level. Also, some previously optional items are now included standard at various trim levels. Volkswagen makes hatchbacks, wagons, sedans big and small, two flavors of SUV, contemporary re-issues of its iconic Beetle design, a minivan and even diesel engines. Yet if VW were a big box store, you'd find the 2013 Volkswagen Eos tucked away quietly in a back corner. It's VW's least popular model in terms of sales by far. The Eos tends to get lost among more popular convertibles, which is curious given its strengths. Its innovative retractable hardtop roof features an integrated sunroof that tilts and slides. The turbocharged 2.0-liter four-cylinder engine -- shared with the sport-oriented GTI, among other VW models -- delivers punchy power and good fuel economy. The Eos also offers an impeccably presented cabin built to standards that exceed similarly priced convertibles. It also offers lots of standard features that help justify its price premium over competitors like the Chrysler 200, Ford Mustang and Mini Cooper. With its size and front-wheel-drive layout, the Eos claims the middle ground between those cheaper rivals and luxury-sport convertibles like the Audi A5 and BMW 3 Series. Maybe the Eos is overlooked because of its eccentric European styling. Or maybe it's because the Eos, though an adept and comfortable cruiser, doesn't dash or twist with any particular vigor. Maybe the small backseat dissuades buyers who intend to drive friends around on sunny days. Maybe it's just very expensive for a small car. Ultimately, we don't believe these shortfalls are deal-breakers. The 2013 Volkswagen Eos is simply too nice a car to drive under a clear, bright sky to rule it out from your shopping list of convertibles. The 2013 Volkswagen Eos is a five-passenger convertible with a retractable hardtop roof. There are four trim levels: Komfort, Sport, Lux and Executive. The base Komfort comes standard with 17-inch alloy wheels, foglights, heated mirrors and windshield washer nozzles, a wind deflector, keyless entry, cruise control, dual-zone climate control, premium vinyl upholstery, a 12-way power-adjustable driver seat (eight-way adjustment for the front passenger), heated front seats, a leather-wrapped steering wheel and shifter, and Bluetooth phone and audio connectivity. The standard eight-speaker sound system features a touchscreen interface, a six-CD changer, HD radio, satellite radio, an iPod interface and an auxiliary audio jack. The Sport model builds on the Komfort feature list with 18-inch wheels, a sport suspension, adaptive bi-xenon headlights, LED daytime running lights, a rear spoiler, brushed aluminum pedals and steering-wheel-mounted paddle shifters. The Lux takes the feature list from the Sport trim and adds different 18-inch wheels, parking sensors, power-folding outside mirrors (it's a Euro thing), keyless ignition/entry, automatic wipers, leather upholstery, an auto-dimming rearview mirror and a touchscreen navigation system (HD radio is deleted). The Executive adds different 18-inch wheels, an upgraded navigation system, a rearview camera and a premium 10-speaker sound system. The 2013 VW Eos is powered by a turbocharged 2.0-liter four-cylinder that makes 200 horsepower and 207 pound-feet of torque. A six-speed automated manual gearbox ("DSG" in Volkswagen parlance) sends power to the front wheels. VW estimates that the Eos accelerates from zero to 60 mph in 7.3 seconds. EPA-estimated fuel economy is 22 mpg city/30 mpg highway and 25 mpg combined. The 2013 Volkswagen Eos comes standard with antilock disc brakes, traction and stability control, pop-up rollover bars and front side airbags that extend upward for head protection. In Insurance Institute for Highway Safety crash testing, the VW Eos earned a top rating of "Good" for both frontal-offset and side-impact tests. With a five-piece retractable hardtop (which includes an integrated tilting/sliding sunroof), the Eos is a convertible when you want it to be and a hardtop coupe when you don't. For full sun exposure, the top retracts in 25 seconds (it requires 16 inches of clearance behind the rear bumper to operate; rear sensors sound if you don't have enough room). Open or enclosed, the cabin features high-quality materials and excellent overall fit and finish. Front passengers will find the Eos spacious enough, but adults in the backseat won't want to stay there long, since the hardtop mechanism forces the backrest to a more upright angle). There isn't much storage space either. When folded into the trunk, the retractable top leaves a roadster-like 6.6 cubic feet of cargo space. With the top up, trunk capacity increases to 10.5 cubes. The Eos' touchscreen interface works pretty well from an audio standpoint (the iPod interface is particularly well designed), but navigation functionality is hampered by the screen's small size. 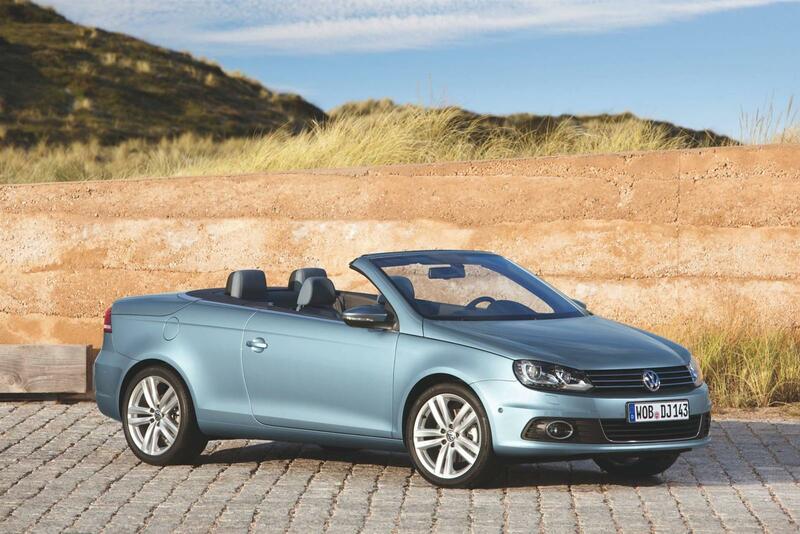 Driving Impressions The 2013 Volkswagen Eos is for drivers who want a relaxed touring convertible. On models without the sport suspension, there's too much body roll and vague steering for serious twisting-road fun. But on the boulevard or a coastal highway, the Eos delivers a soft and composed ride. The Eos' turbo four-cylinder contends with more weight compared with VW's GTI, for example, but it's still torquey and capable. And when the weather prevents top-down motoring, the retractable hardtop provides coupelike isolation from both weather and noise.